Why is the ACL not working? The ACL is applied to the wrong interface. Both can be created by using either a descriptive name or number. Both include an implicit deny as a final ACE. 21 . Which IPv4 address range covers all IP addresses that match the ACL filter specified by 172.16.2.0 with wildcard mask 0.0.1.255? 22. What packets would match the access control list statement that is shown below? 23. What single access list statement matches all of the following networks? 24. 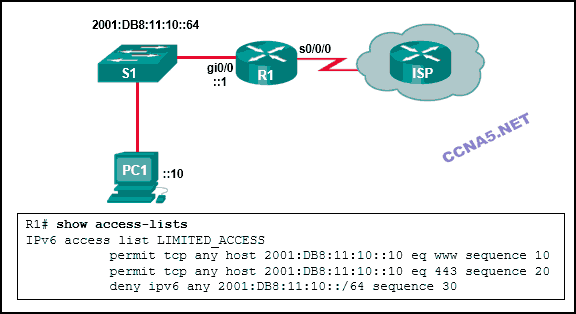 What is a limitation when utilizing both IPv4 and IPv6 ACLs on a router? Both IPv4 and IPv6 ACLs can be configured on a single device, but cannot share the same name. 25. In which configuration would an outbound ACL placement be preferred over an inbound ACL placement? 26. 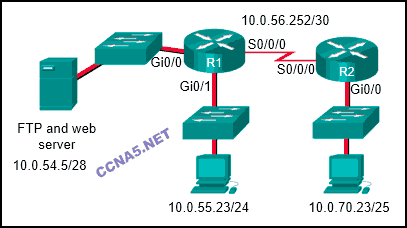 What method is used to apply an IPv6 ACL to a router interface? Refer to the exhibit. What is the result of adding the established argument to the end of the ACE? Any TCP traffic is allowed to reach the 192.168.254.0 255.255.254.0 network if it is in response to an originated request.